This salad is a complete power house of nutrition- packed with antioxidants, plant protein, complex carbohydrates, vitamins and minerals. It is perfect for your lunch box or picnic hamper and can be prepared ahead of time. 1. Cook quinoa and lentils according to instructions on packet, allow to cool. 2. Place pumpkin seeds in oven at 150c for 15-20 minutes - be sure to check on them after 10 minutes to make sure they do not burn. 3. Place all dressing ingredients in bowl and mix well, set aside until needed. 4. Peel and coarsely grate beetroot and place into a medium mixing bowl. 5. Finally, chop half an apple and add to the beetroot. 6. 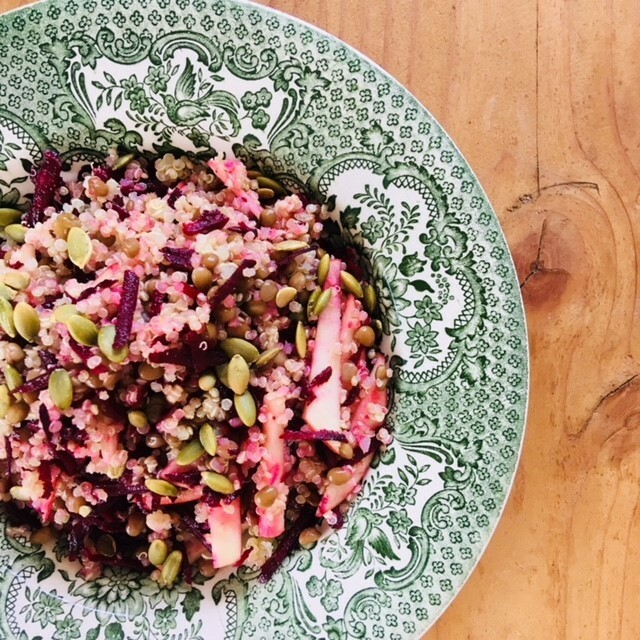 Once cooled, add quinoa and lentils to the beetroot mix, then add dressing and mix well. 7. Sprinkle toasted pumpkin seeds on top. Why not serve topped with flaked smoked haddock, boiled eggs or left over shredded chicken. When cooking quinoa I use a ratio of 1 part quinoa to 2 parts water. Add quinoa to saucepan along with water and bring to boil, then reduce heat and cook for 10-15 minute until all the water is gone. Remove the sauce from the heat and leave to steam for another 10 minutes with the lid on. When cooking lentils, I soak the lentil the night before, then the following morning I drain them and add them to boiled water, cook on a medium heat for 8-10 minutes until lentils are soft but not mushy.